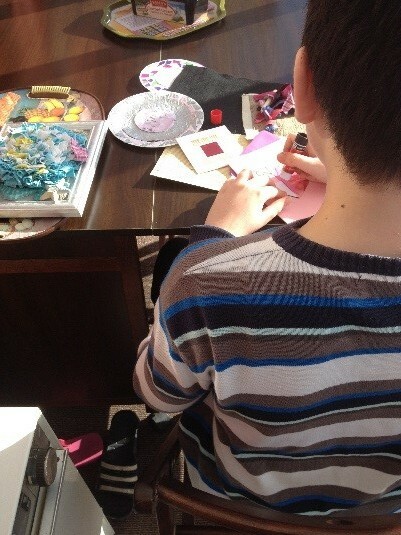 Paper mosaics are an ideal activity for beginners and will keep children entertained on a rainy day or provide some relaxation time to anyone. Creating a beautiful item from tiny pieces can be a healing process and help someone with high stress levels to just slow down a little. 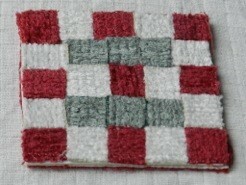 Enjoyment can come from making patterns and putting broken pieces together to make something special. 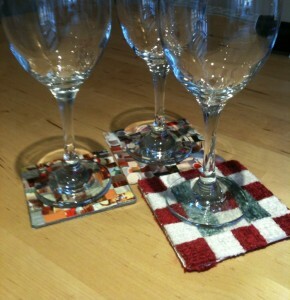 Relax and enjoy a drink, using your mosaic drink mats! Healing and wellness for everyone can come from keeping busy. The elderly benefit from keeping their minds active, whether from crosswords and jigsaw puzzles or creating a colourful mosaic. It can be very therapeutic. 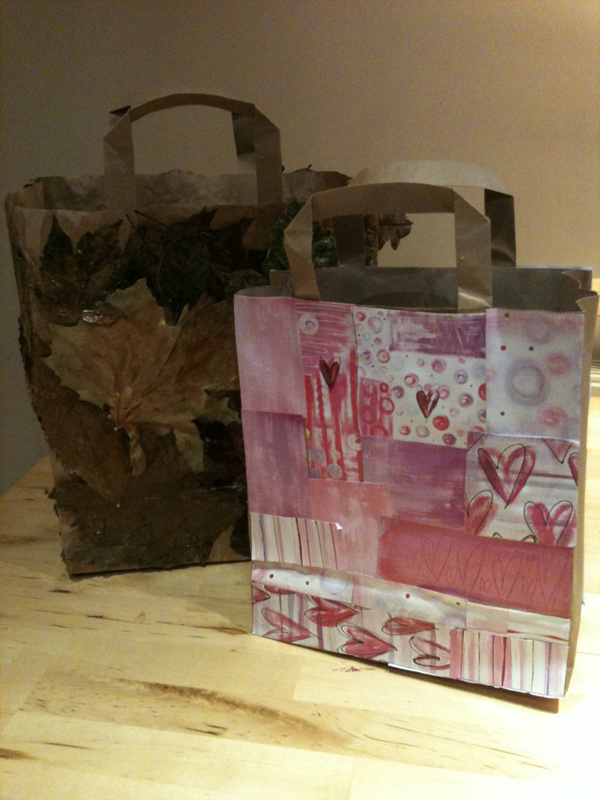 Paper recycling is a good way to create beautiful art. The Craft Kit and Craft Activity Bag provide two cardboard squares and a paper plate on which to create paper mosaics. All you need are scissors. Glue and paper are provided. For abstract paper mosaics, you can tear paper into shapes or cut pieces to the desired size. You can work independently on your own design. 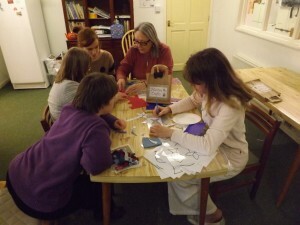 However, if required, help can be given to make an outline of the shape, choice of colours and where to glue on the pieces to make the mosaic. It is all about finding the correct balance between offering assistance and allowing freedom to work independently. The picture on the left and in the centre have been framed with mosaic and the flower picture on the right has an abstract design from torn, green paper that gives it a soft look. This certainly is a tactile craft – you can also use pieces of textured fabric instead of paper for the mosaic shapes. Interest and skill are soon developed. After practising with card, you can move on to making mosaics on MDF, plywood, unwanted tiles or old drinks coasters. 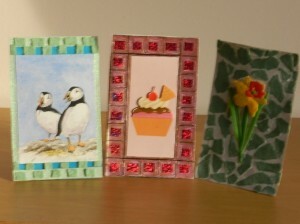 They can be displayed on mini easels, which are available at reasonable prices in lots of craft shops. 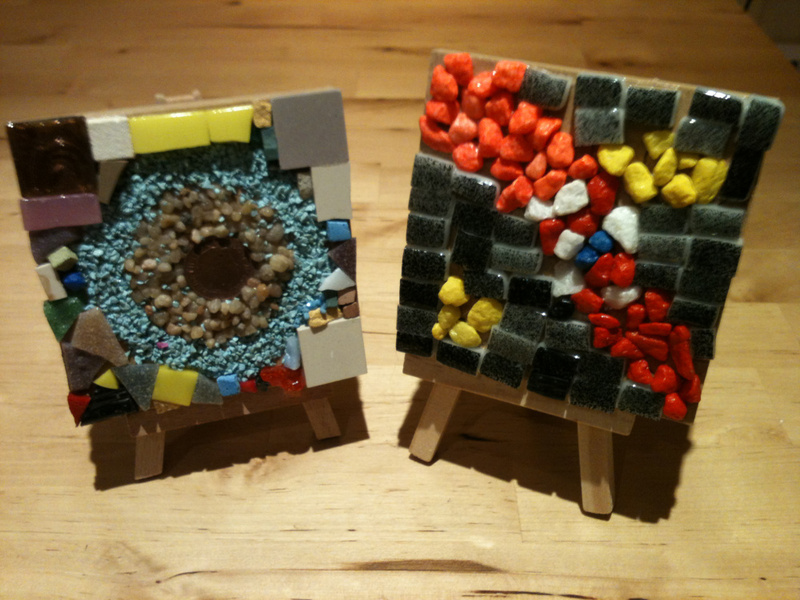 Make the most of using anything you can find at home to create a lovely mosaic picture. For example, you can use patterned paper, card, fabric, broken egg shells, beach shells, sand, pebbles, plastic/wooden/glass beads, buttons, dried pasta shapes, coins or anything else that comes to mind. 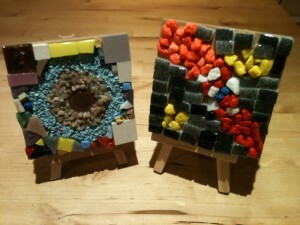 Mosaic art using tissue paper is another area that you may like to explore. Small pieces of tissue paper can be ripped and rolled into balls and stuck in random patterns to make either an abstract picture or something more recognisable, such as the cherry blossom tree below. Another idea to consider is to re-use the brown paper bag of the Craft Kit and turn it into a mosaic gift bag. You can experiment using the sheets of patterned paper and fabric included or any suitable materials you can find at home. 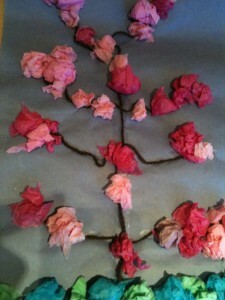 A collage can be created with dried leaves and then given a protective coating by using non-toxic PVA glue. Special craft glues are available from craft shops to give a glossy effect. With all this time spent on craft-making, it is also important not to forget about good posture. People do not always sit or stand correctly and this can encourage aches and pains if the body is not balanced. Try not to round your shoulders and spine by slouching over your work. When shoulders are more relaxed and the body is aligned correctly, it is amazing to notice the overall difference. A sloping desk support can also help to work in a more relaxed and comfortable position.